The updated build also includes vaulting mechanics and weapon ballistics tuning. Developer Bluehole has updated the public test server for PlayerUnknown’s Battlegrounds, adding in new features like vaulting, new weapon ballistics changes, and, apparently, a hidden mock-up of the game’s upcoming desert-themed map. 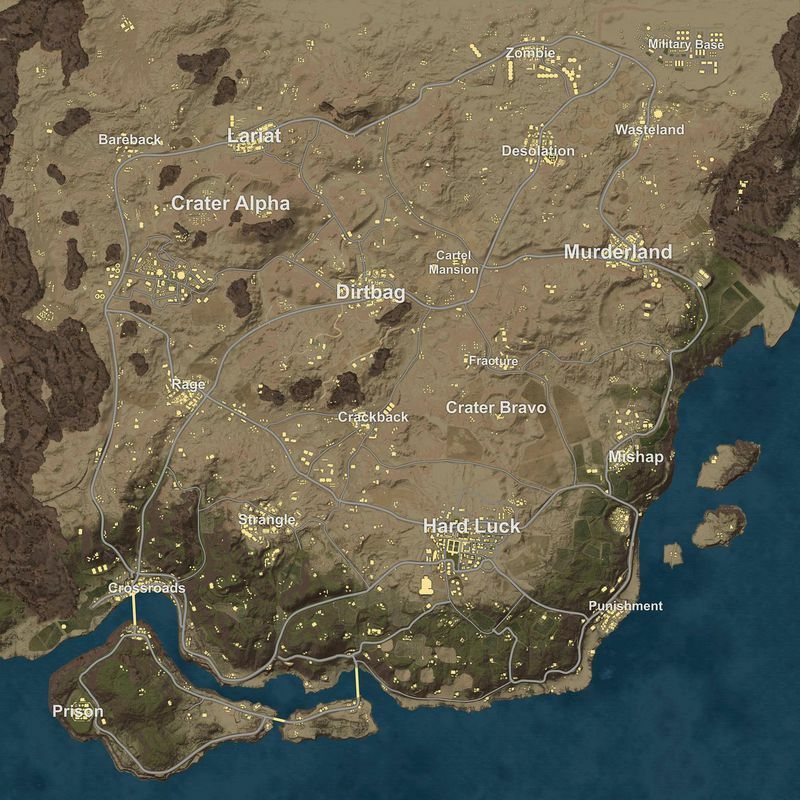 The new desert map draft, which you can see below, was found hidden in the test server update’s data, extracted using the Unreal Engine viewer, and then shared via Reddit. Judging from the colorful names given to certain parts of the map like ‘Murderland’ and ‘Zombie,’ it is assumed that the unearthed image shows an early rough draft of what the final map will look like. Reports from earlier this year said that the desert map will be slightly smaller than the default PUBG map (expanding across roughly 4 kilometers in total), but even still, the image shows there will be a lot of real estate to work with, including massive sunken craters, open windswept plains, and even a separate island complete with a prison. The test build update’s patch notes also outline the major revisions that have been made to PUBG’s weapon ballistics. With the changes in place, projectile speed and velocity is now affected by both gravity and wind resistance (before it was just gravity), every firearm is now reasonably accurate up to a range of 300 meters (welcome news for SMG fans), and bullets now deal more or less damage to specific limbs depending on how close to the target’s chest area they hit (that last change isn’t technically live in the first test build update but will be in future tests). Lastly, test server players can now climb up certain structures and vault over waist-high obstacles, giving them more tactical options when trying to find a vantage point, hide from enemy players, or make a quick retreat. If all goes well with the testing phase, Bluehole says it will be implementing the update’s changes into the live PUBG server relatively soon.